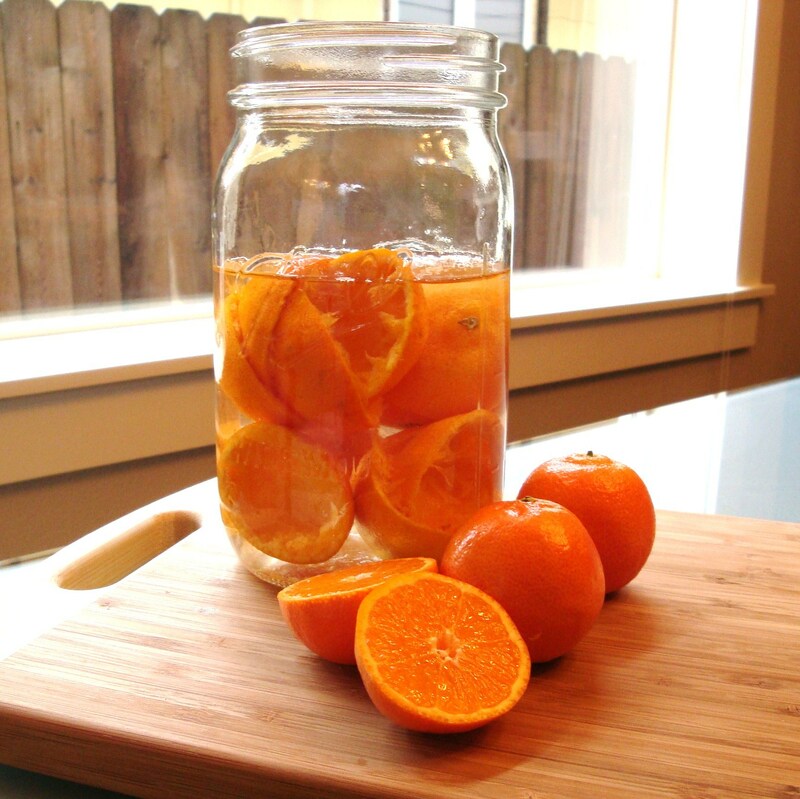 Can you believe it took us this long to post a citrus infusion? A few years ago, some friends of ours shared a homemade limoncello with us. It was the best limoncello I had ever tasted. Naturally, I asked for the recipe. I had just started getting into making home-infused booze, and this was too good to pass up. The limoncello recipe was very different from any other I’ve seen. While the others all require zesting the lemons and infusing for long times, this one just required juicing the lemons, and a much shorter infusion time. The result (perhaps because of the short infusion time) does not give the overly bitter taste of which everyone warns. So we decided to test out a similar recipe with mandarin oranges and gin. 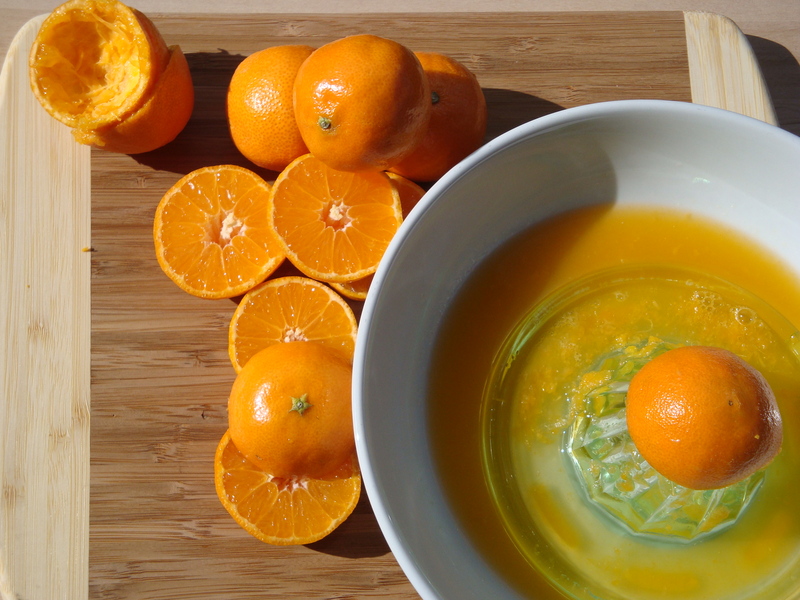 Slice the mandarins in half, and juice them. Reserve the juice for another use (try it in a Mandarin Hibiscus). Place the mandarin peels and sugar in the gin, and let infuse. This is where our original idea started breaking down. The limoncello recipe required only about a one-week infusion time. These mandarins needed more time. We felt the product was ready in about 4-5 weeks. Happily, the flavor is quite good, with no bitterness (perhaps because the mandarin peels have very little pith). But the quick infusion was not meant to be. When the flavor has reached your desired taste, strain and filter. Serve chilled (straight from freezer) or in cocktails. Categories: Infusion, Liqueur, Recipes | Tags: gin, Liqueur, mandarin, recipe | Permalink. beautiful mandarins! is there Sun shinning through your window? I suppose I could have tried it without sugar. But I was going for the limoncello feel, and thought I’d make it in a similar fashion. I think it would be good without the sugar as well! This looks beyond delicious. I can’t wait to make the gin and then the cocktails. Love this one… Gin is my drink. Question for you: how long do you think it’ll last in the jar? Is it something that needs to be consumed within a week? Or can I prolong my mandarin gin over a few months? Hi there, if you make this as directed, it will last for a long time – at least a few months, but more like a year or more. I like this one straight out of the freezer, but it keeps a long time even at room temp.